Filled with firsts, building on past successes, and responding to requests from the community, the fall season at the Aurora Cultural Centre offers something for everyone. The finishing touches are being made on the new fall program which inclues a new concert series, artistic collaborations, and returning favourites just in time for the holiday season. According to Jane Taylor, Program Coordinator for the Aurora Cultural Centre, the season showcases both vibrancy and what people want to see from the Church Street landmark. “We want people to feel this shared space reflects their interest, but beyond that, that it feeds their curiosity,” she says. One of the visual highlights of the season is already installed in the Red and Blue Gallery. Abstract paintings from Miiko are illuminated in the galleries by natural light tinted by the glass art of Greg Locke. 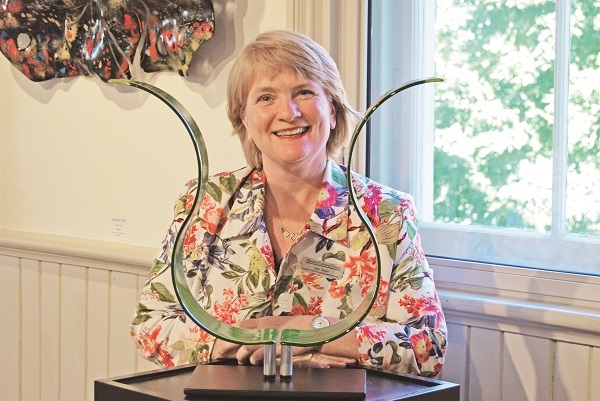 The exhibition of glass art is a first for the Cultural Centre and a brainstorm of curator Clare Bolton that these two very different artists and their very different works would complement each other well. Encaustic work is on display in the Great Hall Gallery featuring work from artists Michelle van Nie and Robin Burnett. They will be on hand to talk about their works this Thursday from 1 – 3 p.m., as well as on October 3 and October 10. Future shows in the galleries this fall include “Borderlines”, bringing together oil paintings, poetry, and iron sculpture by artists Sheila Davis, Jean Kallmeyer, and Tracey Lee Green. This runs from October 18 through November 16 with an artists’ reception on October 26 from 1 – 3 p.m.
After “Borderlines” is taken down, the galleries will be filled with the work of well-known Aurora artist Dorothy Clark McClure. “Bene Acta Vita (A Life Well-Lived)” is an exhibition and sale of the late artist’s work running from November 20 – 30. Curated by her son, Andy McClure, the show will have particular poignancy for both McClure’s family as well as the Cultural Centre. “John Sheard Presents: The Great Reunion” is a new three-concert series debuting on October 4 with Russell deCarle of Prairie Oyster, Wendell Ferguson on January 24, and Terra Hazelton on March 21. The music program continues November 1 with a Patsy Cline Tribute, featuring Leisa Way bringing to life the vocals of the “Crazy” singer, backed by a four-piece band. Folk singer Reid Jamieson will take the stage November 28 at 8 p.m. in a new Indie Music Series. For further information, including tickets, to any of these events, contact the Aurora Cultural Centre at 905-713-1818 or visit www.auroraculturalcentre.ca.